The Basketball Design Clock is a functional piece of time-telling furniture that sports a basketball for every hour of the day, and a hoop at Noon. 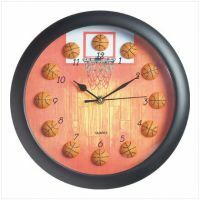 With this unique clock clearly displaying the time, basketball players will never miss a practice or game again! This is the perfect sporty gift for any hoop-time fanatic. Great for all ages.